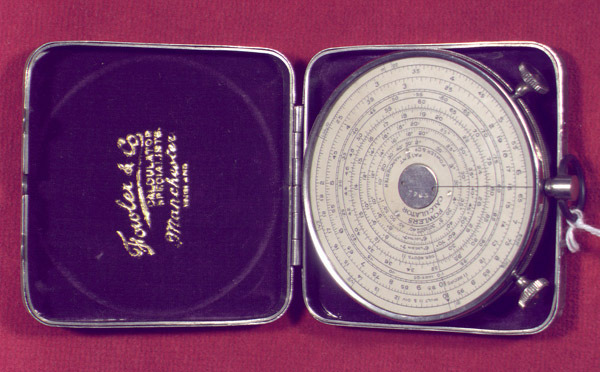 English dial slide rule owned by William M. Thornton. One of the most academically versatile professors at the University, William Mynn Thornton had been teaching Greek at Davidson College before joining the UVa Engineering faculty in 1875. He remained for half a century. In 1888 he became Chairman of the Faculty and in 1904 was appointed the first Dean of Engineering. Civil engineering had been taught at the University before the Civil War. Thornton added mechanical, electrical, and chemical engineering and pushed for a humanities element in the curriculum. By the end of his fifty-year stint on the faculty, Thornton's genius was legendary. Dean B.F.D. Runk later quipped that he could have taught any subject in the curriculum except medicine and "if they gave him six months he could teach medicine." 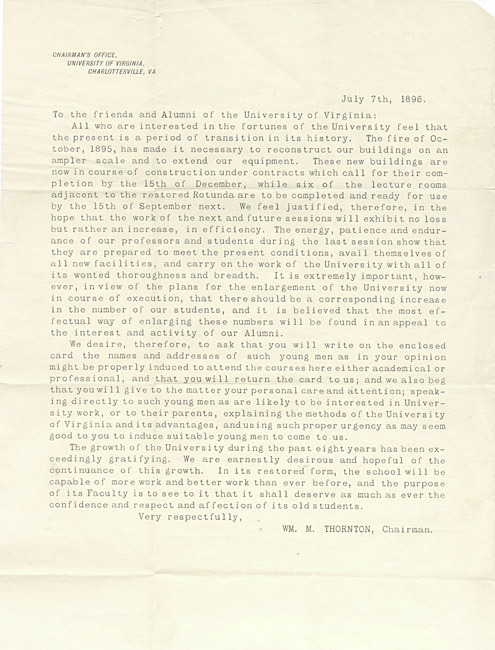 Typed letter from William M. Thornton to "the friends and Alumni of the University of Virginia," 7 July 1896. 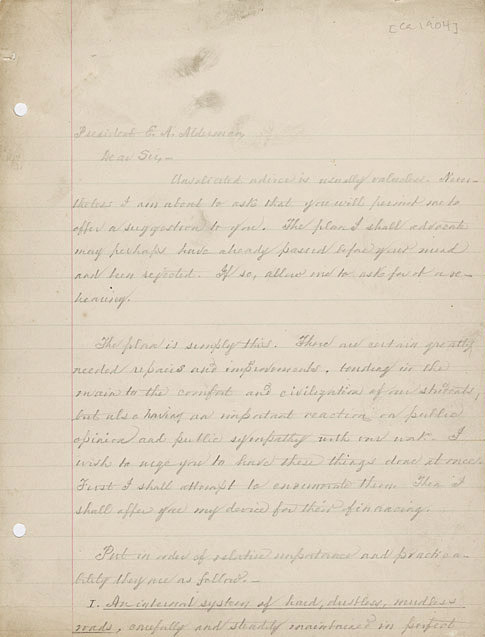 After the 1895 Rotunda fire, Thornton wrote to University friends and alumni requesting them to recommend prospective students and personally urge them to attend. Autograph letter from William M. Thornton to President E. A. Alderman, ca. 1904. When E. A. Alderman was installed as the first president of the University of Virginia, Thornton wrote a letter of advice on improving the University in general including "installation of adequate baths" and a second letter on the finances necessary to enlarge the Department of Engineering to a maximum of either 250 or 500 students. 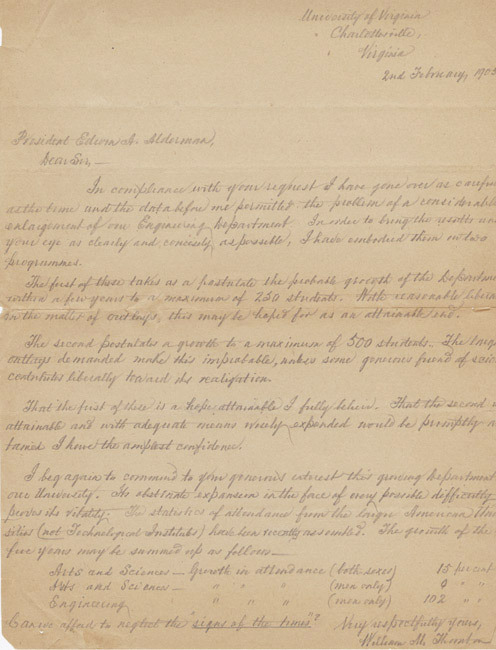 Autograph letter, signed, from William M. Thornton to President E. A. Alderman, 2 February 1905.